I’ve had the need for a high-voltage differential probe for a long time. Mainly for probing mains connected switch-mode power supplies and such. I looked in to buying one but they are fairly expensive for what they are. You can get 25 MHz bandwidth Chinese ones for around 150 € but anything from Agilent/Tektronix/Fluke will quickly run up to multiple hundreds. I looked in to making one and they seemed fairly straightforward. There are integrated single-chip solutions for instrumentation amplifiers but they are usually designed for different kind of applications requiring high DC accuracy and common-mode rejection ratio (CMRR) and very little bandwidth. I tried to find a suitable integrated instrumentation amplifier but I really couldn’t find any that would have a bandwidth of more than a few MHz. Not really good for a differential probe which needs to have a bandwidth of at least 20 MHz or so for most applications. Finding suitable op-amps was still fairly challenging. The devices need to have good CMRR, lots of bandwidth and high slew-rate. The best candidates I found were LT1818 and LT1819 (dual version of LT1818), which have a gain-bandwidth product of 400 MHz and 2500 V/us slew-rate. I was a bit worried about the fairly high input bias current of +-8 uA though. I ran a bunch of simulations with LTspice (which already had models for these op-amps) which were very encouraging, indicating a -3 dB bandwidth of around 150 MHz for the design. Simulating CMRR seemed to give identical results with different op-amp models so I didn’t really trust them, it seemed like the models are very simplified in terms of CMRR. The front-end of the HV differential probe is fairly simple, consisting of basically two resistive voltage dividers. The front-end also has capacitive dividers in parallel with the resistive dividers to adjust the AC response of the probe. There is also a 200 ohm trimmer pot to adjust the balance (which results in DC offset in the output) between the sides. 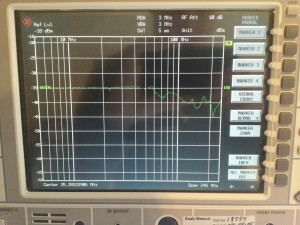 The probe is designed for 100:1 (-40 dB) gain and 500 Vrms. The most critical thing in this type of a probe are the resistive dividers. 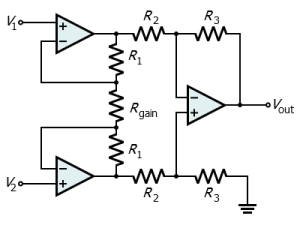 Any difference between the two dividers gets directly converted to a common-mode signal which is undesired. For the dividers I used 0.1 % Panasonic ERA series resistors. There are a bunch of resistors in series to withstand the voltage and also reduce the error in resistance. I didn’t bother measuring and adjusting both dividers to match each other but that is a possibility. The inputs are shorted together in this picture for the CMRR measurement. I had one small bug in the layout; The supply pin for the single op-amp was connected on the wrong pin. Easily fixed by just bridging the adjacent NC and supply pins with solder. The PCB is designed to fit in to a Hammond 1455 series aluminum extrusion enclosure. Haven’t gotten around to enclosing it yet. 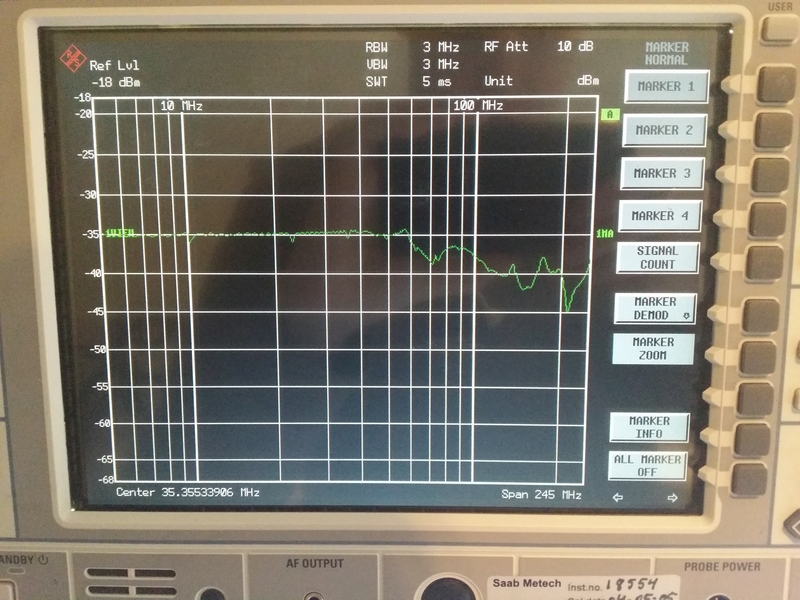 I measured the bandwidth and the CMRR of the probe using my Rohde & Schwarz SME 03 signal generator and R&S FSIQ spectrum analyzer by feeding 10 dBm to the probe and sweeping over the bandwidth (5 to 250 MHz for both measurements) in max hold mode. 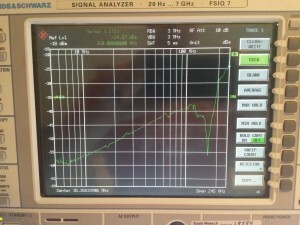 The probe has a gain of -43 dB (200:1) due to the fact that the spectrum analyzer is 50 ohm terminated as is the probe. Performance of the probe came out pretty decent I’d say. It is comparable to lower-range models from Agilent. There seems to be some kind of resonance near 70 MHz which drops the response around 4 dB down. It might be related to the fact that the input of the probe is not 50 ohm terminated or some other resonance like the BNC->2x banana connector adapter. 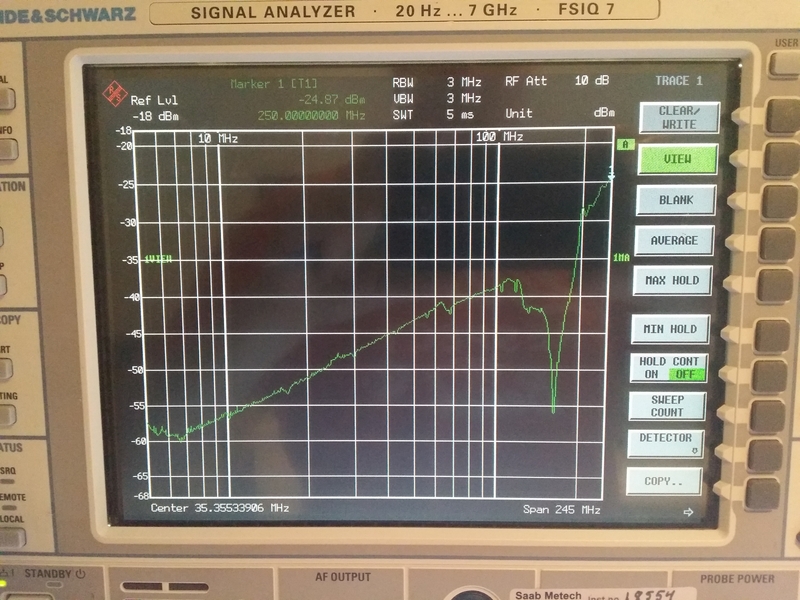 If you discount that dip the -3 dB bandwidth looks to be around 100 MHz with which I’m quite happy with. I’m quite happy with the CMRR as well. There might be some potential for more performance here, I quite quickly tuned the probe and didn’t measure or adjust the voltage dividers in any way. The adjustable capacitors were just tuned by feeding a constant HF signal in common-mode and then I tried to minimize it by adjusting the trimmer caps. 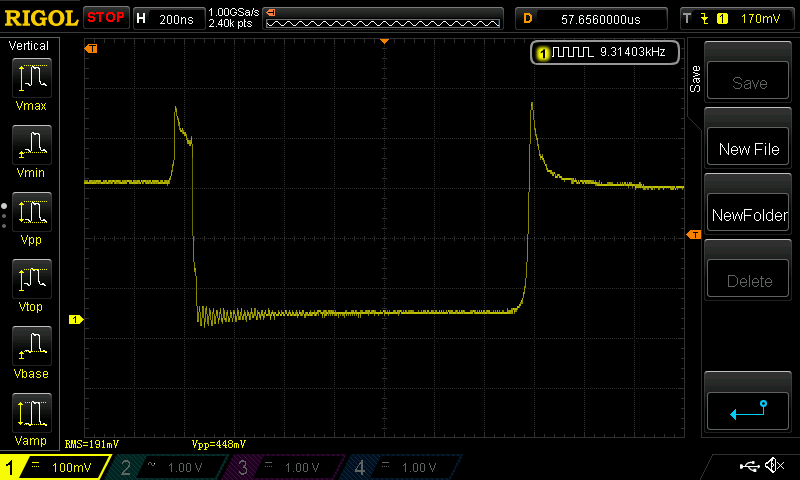 Here is a sample measurement from a Meanwell 5 V switch mode power supply, which seemed to have a flyback topology. Just a single FET with some controller IC. The measurement is over drain-source of the FET. The voltage is quite low (around 100 V peak) in this measurement because I just triggered on the signal when I plugged the PSU in to the wall and the voltage hasn’t had time to rise too high yet. Seems to work! R29=100k, can you check it? there are a number of problems with this circuit. First off the input divider gives 1/100 or 5V out for 500V input, so in order to meet the spec’d 100MHz bandwidth you would need a slew rate of 2*pi*1MHz*5V or 3142V/us while the LT1819 used in the front end can only slew at 2500V/us. This circuit will only be capable of 100MHz at 400V in or less not the spec’d 500V. None of this really even matters though because neither the LT1818 or LT1819 are rail to rail input or output. With your +/-5V rails the input common mode range is only spec’d at +/-3.5V so this probe can really only handle 350V input. The output swing is the same story and is shown as +/-3.25V @ 100 ohm load further reducing the usable range down to 325V. 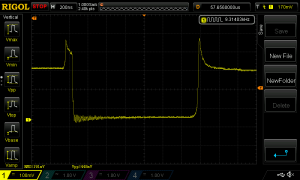 The input bias current is max +/-12uA which across the roughly 3 Meg input impedance gives a +/- 36V drop or rougly +/-10% (20%) error within the ~350V usable input range. That is not even counting the BAV99 protection diodes which have a max leakage current of 50uA granted thats at 150C ambient but even the typical 2.5uA adds another 7.5V of drop across the 3 Meg input resistance. Finally the LT1818 is simply not capable of driving a 50 ohms load to the required 5V swing. In order to do so you would need to swing 100mA of drive at the output not accounting for any cable capacitance, etc. while the LT1818 is spec’d at +/-70mA typical but only +/-40mA minimum, not even close to being able to drive the output properly. Also even though this was mentioned in the article the probe needs to have a gain of 2 added somewhere in order to provide the 1/100 output ratio otherwise when terminated into a 50 ohm load the divider created with the series output resistor will give a 1/200 output. The author goes on to show how it meets his spec of 100MHz but says he used a 10dBm input signal… what? 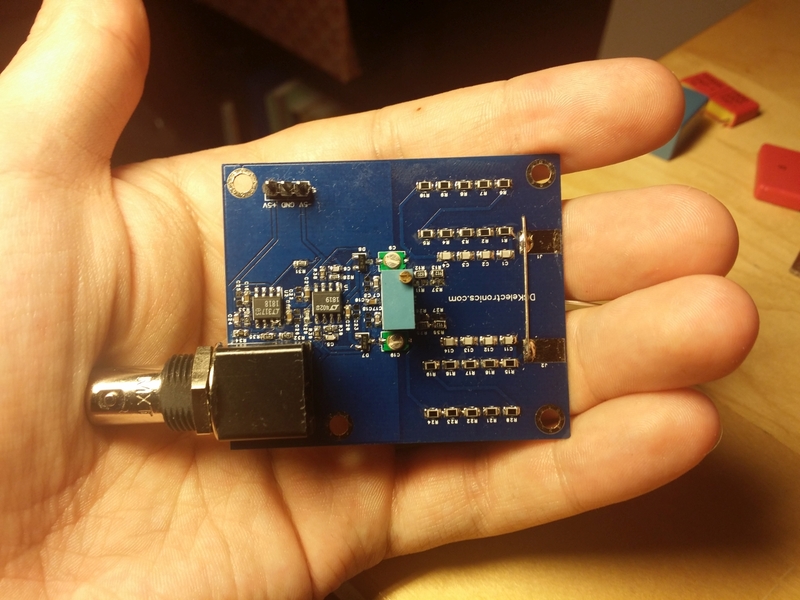 You designed a probe for a 500Vrms input and then you feed it a 2V input and say it works. As I mentioned this probe will not work at all above 350V and likely won’t come close to meeting your 100Mhz well before that. Why would you test with such a small signal level? I believe the author should point out these weaknesses with the circuit so that less informed readers are aware of the limitations. It kind of seems like he is trying to hide it. Thank you for the rude but somewhat useful comment! You’re correct on the LT1819 error due to bias current. This was actually rectified in my actual prototype (forgot to note it in my schematic/article) by lowering input impedance to ~1 Meg so the total offset error is in the range of +-3 %. Accurate voltage measurement is rarely important with a high-voltage differential probe. To fix the issue with input common mode range and output swing you can just increase the divider ratio to 150:1 if 500 V is really needed and 350 V is not enough. As for the bandwidth measurement it should be obvious that this is small-signal bandwidth. I’m also pretty damn confident the bandwidth expressed for other HV differential probes is also measured in a similar fashion. If you look at for example Keysight N2891A datasheet and its voltage derating curve it is specified for 20 V RMS at 100 MHz (+-700 V rating otherwise). From the datasheet you can also see it is not specified for 50 ohm loads (neither is mine) but an oscilloscope which usually has a 1 Mohm input impedance. If feeding a 50 ohm load with a full-scale signal is wanted for some reason then adding a final buffer stage with a gain of 2 (or more) and sufficient output current would be possible. As an output buffer something like a THS3096 should work but if more than around +-3 V output swing is desired then a higher supply voltage would be needed. Cool, good performance aswell for low to medium frequencies. I was looking for a probe just for debugging switchmode PS and this fits just right in. I’ve got your information from web surfing. I have big interests in detection of radiation(gamma). My consideration of the detector is to make chief, comfortable, and efficient device for public use. I’ve interest in your radiation detector. Please introduce me of your product detail? And I also have question. Could you develop multi channel analyzer for analysis of the radiation(gamma) energy spectrum? If possible, I want to develop new models for radiation detection with you through R&D program. In the differential_probe_v1.zip gerber file do you have correct the bug? Hey Dario! The gerbers do have the bug but you can just solder together the pins 7 and 8 on the last opamp and it will work correctly then. Hello William! The PCB is designed with DipTrace. Much nicer to use than Eagle which I use at work. Congratulations !! It’s great to do a differential probe for so little money . I’m building the probe. 0.1 % resistance tolerance is the type 1206 ?. The remaining resistors are type 0603 ? Thank you. Hello Esteban! All the resistors and capacitors in the front-end are 0805 size. All the remaining passives are 0603. Hello! Sorry for taking so long but here is the PCB design: http://www.dgkelectronics.com/storage/electronics/differential_probe/differential_probe_v1.zip But please be aware it has one small bug; The VCC is connected to the wrong pin on the second opamp! But thankfully the wrong pin is just an NC pin next to the right pin so you can just solder bridge pins 7 and 8 together.